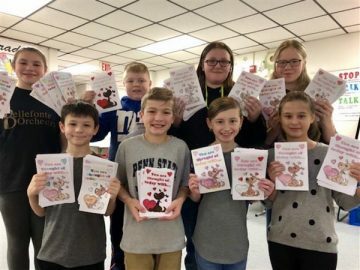 Students at Pleasant Gap Elementary School took the time to make Valentine’s Day cards for local residents and patients at Centre HomeCare. Third-grade teacher Paula Hendershot opened up the project to all students to participate. Saying the students were “happy and excited” to put smiles on the faces of others, the mission was to make the cards as a way to spread the love for others during the holiday. In total, 181 cards were made, and then delivered earlier in the week before Valentine’s Day.